Dia de los Muertos aka Day of the Dead is a traditional Mexican celebration that takes place annually on November 1 & 2. This lively and colorful fiesta honors the spirits of the dead by inviting them to visit on those days. Ofrendas, also called shrines or altars are set up with an abundance of flowers, candles, sugar skulls, pan muerto, food offerings, gifts and photos of their loved ones who have passed away. Families visit the graves, clean them and decorate them with candles and flowers, play music and recall memories of times spent with them. Winchester, TN artist Frances Perea exhibited her Day of the Dead art at the Artisan Depot, 201 E. Cumberland Street, Cowan, TN from October 10th thru November 8th, 2013. She has also erected a Community Ofrenda/Shrine and invited all who wish to participate to leave photos & small offerings of their loved ones who have passed away (including pets). 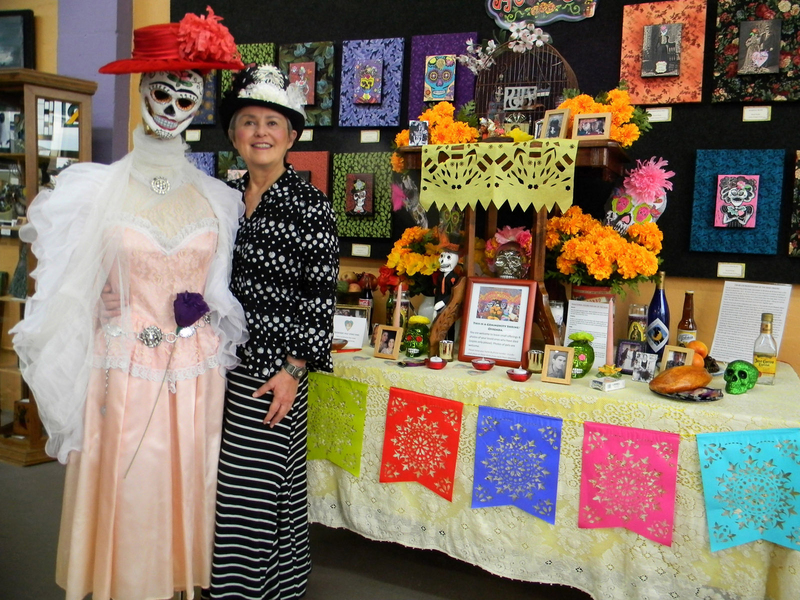 Community members were invited to come in costume to the meet the artist reception. The costume winner received $100 worth of art by the artist.